I mentioned in my review of this printed dress that there were slight issues with the fit. If it fits you perfectly off the rack – excellent. 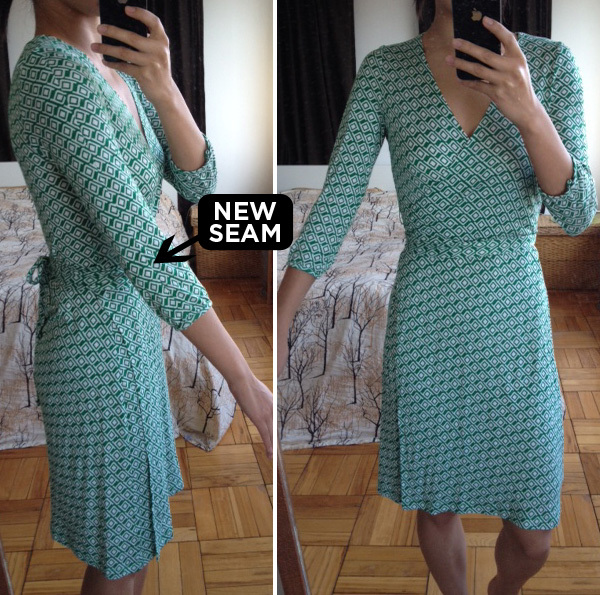 If not, here are three possible DIY alterations (I went with #2) that beginners can do, even if you have to sew by hand. However, learning to sew can be a waste of time if you don’t first learn how to identify proper fit—a concept worth mastering for women of all shapes and sizes. A bargain unlined dress is the perfect piece to practice on! If you don’t own this dress, the general concepts below can easily be applied to various garments – blouses, tank tops, dresses, etc. I’ve done the shoulder part in #2 quite a bit with tops that are too low/gaping/long. Alteration # 1: Slimming sleeves and making armholes smaller. Problem: Armpits are too big and sleeves are too loose. If you are taller or have a longer torso, then this may be the only alteration you need. Secure both ends of the stitch by knotting your thread, or by back-stitching on your machine. If you have a serger machine, trim off the excess fabric and re-serge the raw edges. Difficulty Level: Beginner. Takes about 10 minutes by machine, longer by hand. Before you begin any sewing project…having an iron ready is key. After you sew on the inside-out garment, flip it back to the right side, iron down the seams to smooth out the area, and try it on. If the alteration doesn’t look right, remove stitches, iron the fabric smooth again, and re-sew as necessary. I like to use fabric chalk to mark my measured lines, then secure the fabric with pins before sewing. NOTE: The sleeves of this dress are gathered and banded at the hand opening, and is more narrow there. You need to taper the slimming to be less and less narrow as you get closer to the opening. 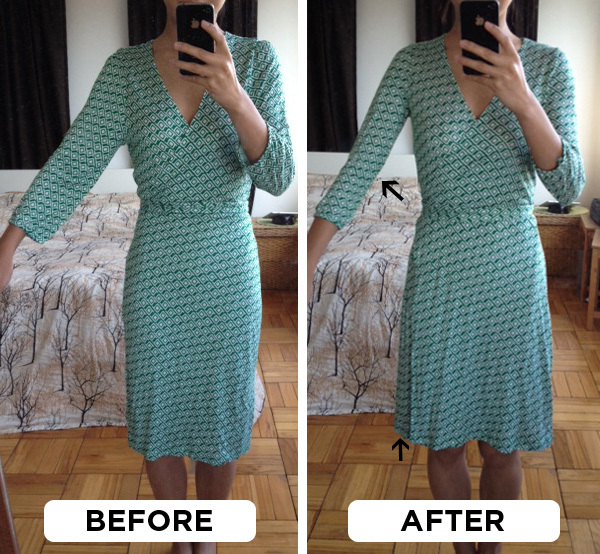 Alteration # 2: Slimming sleeves, making armholes smaller, raising the neckline and hem. Problem: In addition to the two issues above, the length is too long, the waist hits too low, and the neckline is too low. These are symptoms of how regular-sized garments often fit on women who need petite sizing. Solution: Instead of taking the dress in at the armpit, take it in along the shoulders. 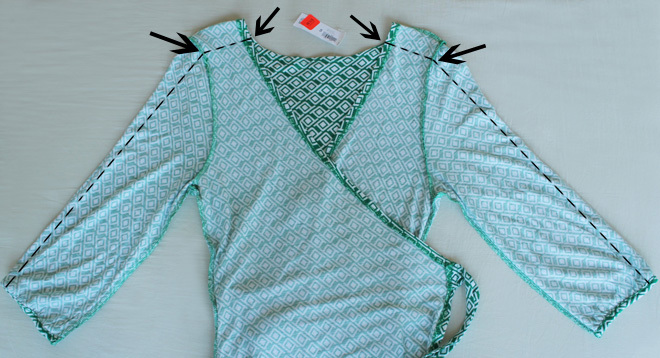 This will effectively raise the neckline, torso, and shorten the total length. In the “after” pic above, the resulting higher neck and waistline on me are not distinctly visible, however one sign is the better-flowing A-line shape of the skirt. In the “before” pic, I had to wrap the dress so tightly to conceal the gaping neckline, that the skirt started to lose it’s flowing shape. Difficulty Level: Beginner. ~10 minutes by machine, longer by hand. NOTE: This alteration is a simplified shortcut (that will make some professional sewers cringe), and will result in a new seam along the upper side of both arms. I don’t recommend this for solid garments, however I think the pattern on this dress hides the new seam fairly well. Alteration # 3: Alteration #2, the proper way. Problem: You want to achieve the effect of alteration #2 but you don’t want new outer seams down the arms. 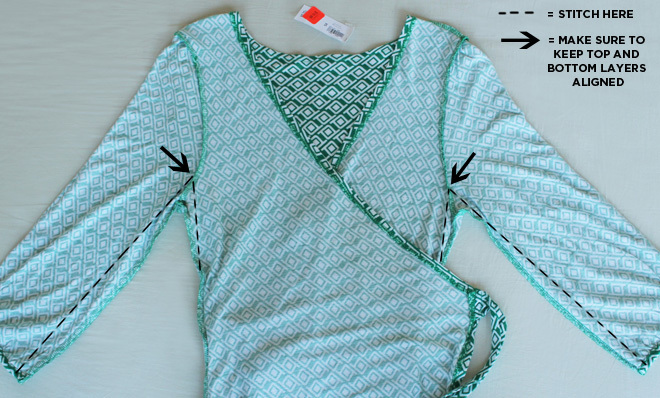 Solution: 1) Using a seam ripper or tiny scissors, take apart all seams connecting the sleeves to the shoulders. 2) Take in the shoulders from the top. 3) Slim the sleeves from the bottom, pre-existing seam, making sure the new width will align with the newly-sized armpit hole. 4) Re-attach the sleeves to the torso. If this were a more expensive dress, I definitely would’ve gone this route. However, I’m not a great sewer so it would’ve taken me hours versus 10 minutes (for alteration #2). Either way, I just wanted to show these methods for anyone with little to no experience sewing, as an option to do easy fixes at home and save on $$ alterations. On a separate note, I’ve always kept comments open on this blog to encourage the sharing of ideas and constructive feedback. I value comments as a means for interaction and read every single one. I understand that clothing choices are a subjective matter, and there will always be differing opinions. All I ask is for common courtesy when expressing your thoughts. Just because we’re on the Internet doesn’t mean we can’t show the same respect and decency to each other that we would in real life. I love your tailoring posts — I haven't gotten up the courage to try it myself yet, but I'm learning! I'm not the biggest fan of camisoles under a low neckline, but sometimes it's just necessary. A bandeau may be uncomfortable, so I would try just a camisole in white, beige, or maybe the same shade of green? Omigosh, no : ) If I went that far I would've gone all the way with alteration # 3. That image is the result of some photo editing. A very basic Brother or Singer machine will cost about $80 on Amazon with free ship. Hey, I just want to let you know you are doing an amazing job! I am five eight, 135 lbs, and all legs, but I appreciate all of your blog post! Being really tall with really long limbs I cannot say I always relate exactly, but every woman deserves well fitting clothes and your blog helps us achieve that! I know this all has to be very time consuming, so I just want to share my admiration and appreciation! This is awesome! I'm getting more and more interested in sewing because of you! Such a great post! The changes made such a difference in the fit of your dress – it looks great on you. Thank you, thank you! 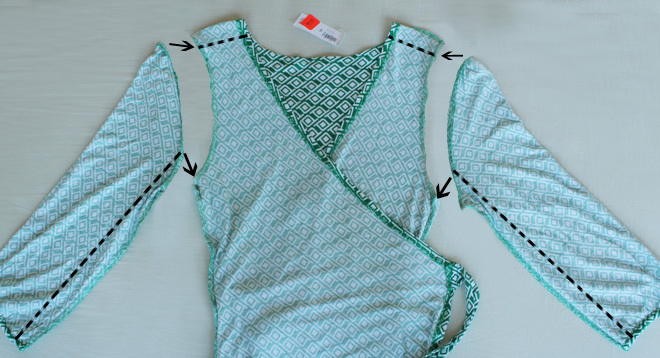 I've been at a complete loss for an easy way to make armholes smaller and raise the bust area. Even petite sizes are too long-waisted at times. This solves so many clothing issues for me. Please keep the alteration tips coming, they are changing my wardrobe options! where do you learn the sewing? How long does it take to finish the new dress? I always have this problem, even i cannot sew, I really need this info, thank you so much! i love your diy alterations posts! and it does not look like it does on the model. I'm pretty much swimming in it. It fits perfectly in the shoulders and arms and yet, the waist is just too boxy and loose. I tried to find a tutorial on your previous posts but couldn't find one. Any tips? The material is polyester. I find these tutorials soooo helpful. As a penny pincher, I'm always looking for ways to save money, especially on things I can do myself. I hope you keep posting these kinds of posts. So informative! I was thinking about attempting #3 on my dress. What string would you suggest? These are some of my favorite posts from you, especially as a fellow petite lady. Unfortunately I do not have a sewing machine, which I'd prefer over sewing some of my potential projects by hand. Thankfully, for now, I don't have anything that's in desperate need of altering. As Jen mentioned about your regards to negativity, you handle it with such class. It's truly what mom's teach their children, "Treat others the way you want to be treated." Was this jersey fabric? I bought the long cobalt blue skirt (from a previous post) from ON, but unfortunately they were sold out in petite so i need to hem it. I am an exeperienced sewer, but jersey makes me nervous. What stitch would you use? I don't want the fabric to stretch. Thank you SO much! It's sooo difficult to find sewing advice online (compared to knitting for some reason). I always have the armpit problem and have been trying to find a fitting solution! Thanks for giving all of the options too! I LOVE YOUR BLOG… especially the when you teach how to's, like this one. Thanks a lot! I love your website I have the same problems I'm 4'11 & 95 pounds but I'm afraid to take the risks you take (I have no sewing abilities). I was wondering if you would do a blog post about casual clothing i.e jeans. Also what other thrift stores do you go to because there's no Savers by me. Hi – I've found that those little 'faux' camisoles that attach to you bra strap, actually don't look too bad,, when you just have to have something to fill in a little. I've been able to wear a lot more of my things to work, that I wouldn't have before, and there is no added bulk, either. Not to mention they're comfortable – you don't even know it's there. My set came with black, white, and natural, and they have 2 options for attaching (higher coverage or lower). I found them at bed & bath of all places, but you could google it and find them elsewhere I'm sure. They are such a help for us shorties, for which many things are cut too low!!! I wear those "dickies" that attach to your bra straps with everything! they're a great option and a real life saver. I think one brand is called "cami secret" at walmart and I've seen them in varieties of colors, even leopard print! This article is a dress-saver. I have a lovely dress which is far too low in the v-shaped neckline, & after many botched attempts to alter it, I looked online. And found your blog, with such very clear instructions. I now know how to alter it – not sure if I'll do the short-cut (#2) or the 'correct' but longer method (#3), but at long last I'll be able to wear the dress. It's been far too many years (about 25) since I last made clothes & I've forgotten most of what I once knew, which is why blogs like yours are so brilliant. Hellooo Extra petite !!! I loved so much your blog from the first sight when I saw…. And your advices and tips for sewing they helped me so much thank you about that …. And also helped me so much with your advices for styling clothing and how to style differents pieces …… Wish you luck and all the best….. I'd love to do Alteration 1 on a shirt: however, the sleeves are made of mesh and I'm terrified I'll make huge holes in it, or the whole thing will come apart if I cut it. I hand-stitch and am a relative beginner (I own no machine) – is there anything I should be aware of when working with this material? Thank you to anyone who can help!